The Roman fort at Low Borrowbridge lays in a field next to the main West coast railway and just off the A685 from Kendal to Tebay. The fort is undated, and is fairly well hidden. The interior covers an area of around two and three quarter acres, and consists of a turf covered platform, with embanked ditches to all four sides. The earthen embankment has a dry stone wall built all along it…nothing to do with the Roman fort. Between the back end of the fort and the railway line, there are the faint outlines of two square structures with stone foundations, more than likely the footings of a pair of guard towers. These feint remains lay on the North face of the fort, guarding what would have been the North gateway, and protrude about five feet outside the walls. The footings of the guard tower are possibly visible beneath the telegraph poles in the photo below. The West side of the fort seems to have an array of around 4 ditches which in turn travel along the South side of the remains. About 60 yards North of the South West corner of the fort, the remains of the West gate can still be seen. The remains indicate that this gateway would have been a single track entrance of around six feet wide. Above. A view of the Western ramparts, with the modern field wall on top. Some of the outer face of the ramparts were cleared in 1883 and then again in 1933. These remains consists of an offset course of large limestone blocks topped by a course of sandstone, above which the wall seems to have been loosely rebuilt. The rebuilding appears to have blocked the remains of the North gate. Above. Looking West towards the fort's ramparts, with Birk Knott in the background. There are no indications of any internal buildings....years of ploughing has probably destroyed any evidence. A fire place was however discovered during excavations in the centre of the fort in 1826. Above. A view of the fort's Northern ramparts and defensive banks. In 1883, a fragment of walling and a pavement of bright red concrete (pounded brick) with a raised border round it, was found in the gardens of the nearby farm house, then an inn. 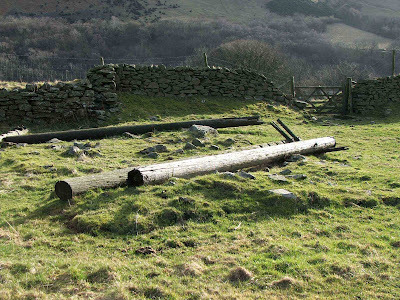 These remains, partly destroyed in 1933, probably represent the fort’s bath building. To the North of the fort, a flat piece of ground was found that was suggested to have been the parade ground. However, due to its small size, this idea has since been ruled out. 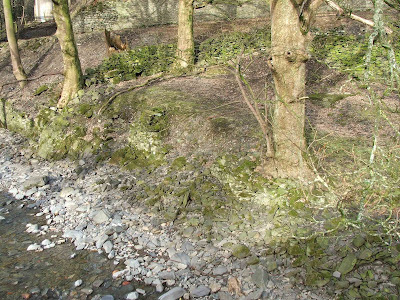 To the North of the fort, the stone abutments of a Roman bridge crossing the river can allegedly be seen in the river embankment. 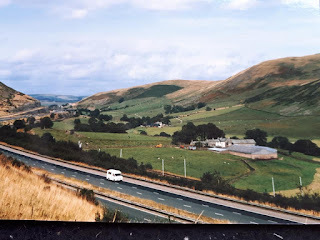 There is some great information about the fort here, at the Lunesdale Archaeological Society website, especially relating to work that took place between 2014 to 2017.